Summer was a spectacular season for the clients of St. Francis Food Pantries and Shelters. Ross Stores continued to donate thousands of new home goods and clothing items for our clients. Abigail Garcia, Operations Supervisor coordinated the very generous donations. Thousands of cases of food were delivered to Food Pantries, Soup Kitchens and Shelters in our network. This was made possible through the generosity of our many donors to our "Stocking the Shelves" program. The Ralph Lauren Foundation hosted two Peanut Butter & Jelly Sandwich Days. Alyssa Youngerman recruited over 200 of their volunteers for the two events. All totaled they made more than 9,000 sandwiches which were distributed to eight Food Pantries and Soup Kitchens we help. Our annual "Family Barbecue" was held for over 500 needy families at the Affinia Manhattan Hotel. Con Edison presented the event and Macy's was the Food Sponsor. Volunteers from the America India Foundation joined Con Edison volunteers to serve the "country western themed" luncheon. The Morgan Stanley Foundation was the latest corporation to join our Peanut Butter & Jelly Sandwich Days. Over 160 volunteers organized by Erin Greenbaum from their Community Affairs Department made over 5,000 sandwiches for our "Brown Bag" Feeding Program. A "Fourth of July Celebration" was a perfect way for our Soup Kitchen clients in New Rochele to join in the traditional patriotic fun with the rest of our nation. The Tenth Annual "Women of Valor" Awards Tea was held at the Waldorf Astoria Hotel. Nearly 800 supporters attended this fundraiser which honored 8 outstanding women from the real estate and construction industry. Over $400,000 was raised to support St. Francis Food Pantries and Shelters. Joan Lunden was the Honorary Chair and Keynote Speaker. The Honorees were: Guest of Honor - Ellen Canny Goldberg, Humanitarian Award Recipients - Michelle Cooper and Tina Vasan, and Claris Award Recipients - Cynthia Boyea, Christine Chipurnoi, Diane De Chiaro, Karen Dome, and Cindy Feinberg. The "Summer Fiesta" was presented by Crana Electric, Inc., Innovative Communication Concepts, Inc., and TPG Architecture at the Affinia Manhattan Hotel in midtown Manhattan. Con Edison and Macy's were the Food Sponsors for this "south of the border" themed luncheon for over 400 clients from one of our Food Pantries. Orchard Beach in the Bronx was the location for our annual "Back to School Picnic." A great picnic lunch was enjoyed by over 200 for a group of Grandparents who are now raising their Grandchildren. Backpacks filled with school supplies were given to all of the children to get them ready for the new school year. 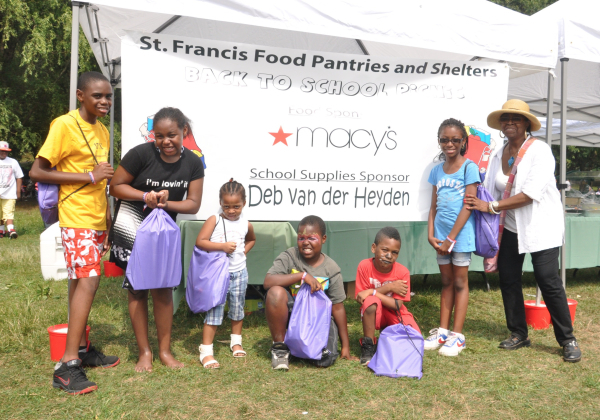 Macy's was the Food Sponsor and Deb van der Heyden, Managing Director from Jones Lang LaSalle was the School Supplies Sponsor. Each season our sponsors, supporters and volunteers continue to help St. Francis Food Pantries and Shelters further our mission of helping the poor families in New York. We thank every one of them.